You may like these fried leeks better than french fries. Pair them with a perfectly cooked, uniformly rare steak for a meal that rivals any at your favorite steak house! Leeks naturally separate into thin layers that are uniform in thickness so they make fries that crisp up quickly without a coating of flour or batter. They have so much flavor you won’t need a dip or sauce. Fried leeks have been popular for a very long time; Martha Washington had a recipe for making them! Early Colonists left their leeks in the ground all winter so they could be harvested, fried in lard, and served as a side dish or garnish when other vegetables were scarce. Cut off the green top and use only the white and light green part of the leek. Save the green top to add flavor to soups and stews. Trim away enough of the root end to allow the layers to separate into layers. Cut leek crosswise into 3-inch long pieces. Split the leek segments lengthwise and flip through the layers like the pages of a book to check for any trapped dirt. Rinse well and drain. Cut the leek into narrow (about 1/4-inch-wide) slivers. Dry thoroughly between paper towels. Heat the fat or oil to 350°F in a deep fryer or heavy saucepan. A fryer or pan with a wire basket is best, as it allows you to remove all the leeks at once when they are done so none of them overcook. Alternately have a slotted spoon or spider handy for dipping them out. Add the leeks to the hot fat and fry for a few minutes until crisp and golden brown, stirring so they color evenly. Watch carefully so they don’t burn. Dip out and drain on paper towels. Sprinkle with coarse salt and keep warm until time to serve. Fried leeks can be served as a side dish like french fries or as a garnish. Count excludes most of the frying fat, since it is drained off. This is an easy method that guarantees that your steak will be medium rare all the way through, not just in the center. Take the steak out of the refrigerator 30 to 45 minutes before cooking so it will come up to about 70°. Sprinkle on all sides with salt, pepper, and Herbs de Provence or other steak rub. Drizzle with oil and rub in. Preheat the oven to 275°F. Place steak on a rack in a roasting pan and cook until internal temperature reaches 125°F, about 45 minutes. Remove from oven, tent loosely with foil, and let rest for about 15 minutes or until temperature reaches 135°F. Heat an iron skillet until hot. Sear steak for about 1 minute per side or until nicely browned. Slice across the grain and place on a heated platter. The steaks do not need to be rested again, so serve at once with with Fried Leeks. Recipe inspired by one from FudeHouse.com. *Note: Scientists at Kansas State University discovered that adding certain spices to fried, broiled, or grilled foods could inhibit the formation of heterocyclic amines (HCAs), compounds that may be carcinogenic. Rosemary had the strongest protective effect of the spices tested, reducing the potentially harmful substances by up to 79 percent. From a news release from the Food Safety Consortium, May 18, 2010. 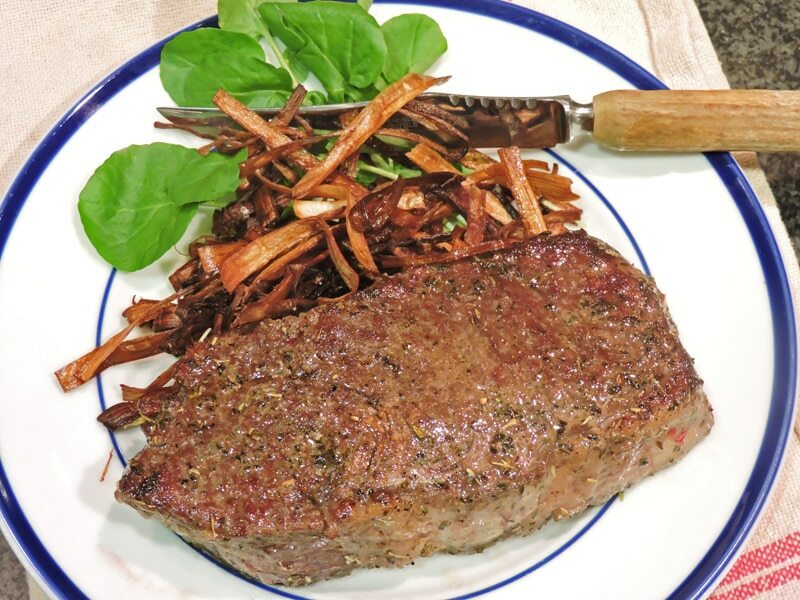 Benefits of cooking with herbs, Fried leeks, Herbs, How to cook a perfect steak, Rosemary, Steak. Bookmark. So much easier to read, so much cleaner. I love it and i want to eat that steak! Thanks, Carolyn; I feel like I’m trying to drive a car with no brakes! It is all so different. I think I just accidently sent out a bunch of e-mails to everyone on my newsletter list. I was trying to edit a few posts and Mail Chimp sent them out as if they were new posts! Sorry if you got them. I haven’t tried fried leeks yet but I love fried shallots and green onion. I can’t wait to try this. I also like your method for cooking the steak. That is how I cook my tri-tip and it is always perfect. I love you new site. Thanks for sharing such great info and recipes. I know you are going to love them, Kim. I can’t believe it didn’t occur to me to try frying them sooner!